Hilarious. After shutting out Chinese scientist from US space science conferences since 2011, NASA embarrassingly asked China to extend the lifespan of China's Queqiao relay satellite from three to five years to facilitate the planning of an American moon mission and possibly use for NASA's own planned landing to far side of the moon. according to Wu Weiren, chief designer of China's Lunar Exploration Program. It is embarrassing, but I can't blame NASA scientists for it because the shutting-out of Chinese scientists were not NASA but US administration (Obama or Trump?) and congressmen. NASA actually invited Chinese scientists to their international conferences. Scientists and Engineers care much less of national competition or the fake reasoning of security concerns, they want to speed up their research by working together. That is not to say CNSA should give NASA a free ride, not at all. A fair bit of return (price) from NASA would be NASA sharing with CNSA their Mars landing data and experience for the upcoming Chinese Mars mission. Yodello, newbird, sangye and 3 others like this. I don't think it is good idea for NASA to use Queqiao relay satellite, why NASA can't send the similar satellite by themselves? ... I thought China stole it from NASA, no? Yodello and KIENCHIN like this. Highlighting in blue for you. In addition, China has offered Chang'e-4 as a beacon for the planned US landing. US Government and Congress should be ashamed for humiliating NASA, Their arrogant tough guy posturing at expense of science has come back bite us by demeaning a prestigious US scientific agency. NASA has cooperated on lunar research with China's Chang'e -4 probe, a Chinese space official told the Global Times at a press conference in Beijing on Monday. The two sides have never ceased to talk about cooperation in lunar and deep space exploration, Wu Yanhua, deputy director of the China National Space Administration (CNSA), said at a press conference organized by the State Council Information Office that outlined China's latest timetable for lunar and deep space exploration. NASA was particularly interested in knowing how dust would move when the Chinese probe landed on the moon, Wu noted. "In response, we immediately offered our moon-landing schedule and location to the US Lunar Reconnaissance Orbiter in lunar orbit," Wu said. Due to a fuel shortage, the US orbiter could not change its orbit in time for the landing, but NASA observed the situation later when its satellite passed above the Chinese probe, he said. Such cooperation was in line with humanity's shared interests, Wu said. China and the US should cooperate more in the human exploration of space, he said. China will conduct a Mars mission by 2020 and bring a sample back from the moon in 2019, Wu said. Thanks to the Chang'e-4 lunar probe, China has realized the first-ever soft landing on and "cruise exploration" of the far side of the moon in human history as well as the first-ever telemetry, track and command (TT&C) and data transmission between the Earth and the dark side of the moon, Wu said. 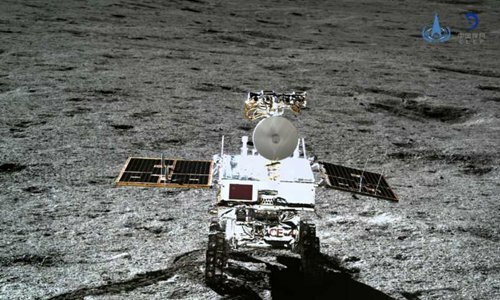 The lander and rover Yutu-2, or Jade Rabbit-2, were in good condition and had achieved their preset engineering goals, said Wu, also the deputy chief commander of the China Lunar Exploration Program. "The Chang'e-4 lunar probe program has achieved a complete success," he said. Data collected by domestic and international scientific payloads were downloaded normally and the Queqiao, or Magpie Bridge, relay satellite provided effective TT&C support. The mission has moved onto its "scientific exploration phase," Wu Yanhua said. The scientific phase has three goals, according to Wu Weiren, chief designer of China's lunar probe program. "The primary goal is to study the geographic and geomorphic conditions of the moon," he said. China has achieved the first cutaway view of the moon which monitors up to 200 meters underground, Wu Weiren noted. Such a view would significantly help understanding of the origin and evolution of the moon, he explained, perhaps even reveal its true age. The second goal is to study the space around the moon including cosmic and solar radiation and its impact on the moon, Wu Weiren said. Finally, scientists will assess the "matter composition of the moon," he said. "These all are firsts in human history," Wu Weiren said. "Any achievements made in these research areas will be original and have a massive influence both at home and abroad." International payload cooperation and joint exploration has been realized by China for the first time during the Chang'e-4 mission, Wu Yanhua said on Monday. The Chang'e-4 probe is equipped with 13 payloads including Longjiang, a lunar microsatellite, and four scientific projects in cooperation with Germany, Sweden, the Netherlands and Saudi Arabia, according to CNSA. The four were selected in April 2015 from applications for cooperation on 20 payloads developed by more than 10 countries to be loaded on the lander, rover, relay satellite and the lunar microsatellite, Wu Yanhua said. A station located in Argentina has also participated in providing TT&C for the mission and the radioisotope heater units (RHUs) in cooperation with Russia, which guarantees the safety of the Chang'e-4 probe during the long, freezing lunar night. CNSA was willing to share data collected by all payloads on Chang'e-4 with space agencies, research institutes as well as space exploration enthusiasts from all over the world, the CNSA deputy head said. China still has unmanned Chang'e-5, -6, -7, -8 missions coming up until 2030, Wu Yanhua disclosed to the media on Monday. Chang'e-5 will return samples from the moon in a mission scheduled for the end of this year. Chang'e-6 will conduct a similar sample return mission, but from the south pole of the moon, he told the Global Times. Whether the Chang'e-6 probe will land also on the far side will depend on the Chang'e-5 sample. Chang'e-7 will comprehensively explore the moon, whereas Chang'e-8 will explore the possibility of building an international lunar research base, the CNSA deputy head said. Chang'e-8 will test 3D printer technology in hopes of assisting future lunar residents. As for putting humans on the moon, China is thinking about that, but no decisions have been made, Wu Yanhua said. "China's space station is currently under construction and slated to be completed around 2022," said Li Guoping, CNSA spokesperson, at the conference. China is inviting the international community to join in the process, enhance communication and cooperation in areas such as development of devices, space applications and astronaut training. China also welcomes scientists from all over the globe to conduct scientific experiments at the Chinese space station, Li said. Equation, N00813 and antiterror13 like this. You need to read closer yourself. NASA and CNSA have not yet finalized any agreement to allow Chang'e-4 or Queqiao to be used in cooperation with future NASA missions. Just so that the track of discussion is not lost, @Rachmaninov asserted his own opinion in favor of NASA's request for Queqiao to be used in its own mission, while you replied that they are "already doing that." However there is only news that they are have merely received such a request, not that they are agreed to it, and that CNSA has so far only cooperated with NASA in sharing the lander's location and schedule. zealotaiur485, N00813 and Rachmaninov like this. Only because this cannot be finalize without US Congress Approval and partly because NASA is closed due to US Government shutdown. For this purpose, the space agency has recently held a series of meetings with the China National Space Administration (CNSA) to discuss a possible collaboration for the end of January, NASA revealed in a news release. If this initiative is approved by the U.S. Congress, it would allow NASA the opportunity to observe a signature of the Chang’e-4 probe’s landing plume with the LRO Lyman-Alpha Mapping Project (LAMP) instrument, NASA Associate Administrator Thomas Zurbuchen announced via Twitter. Since the U.S. space agency is required by law to get advanced approval for any cooperative effort with Beijing on space exploration, as noted by the Russian news agency Sputnik News, NASA emphasized that any cooperation with China will be “transparent, reciprocal, and mutually beneficial,” in keeping with congressional and Trump administration guidelines. Pending approval, NASA is planning on pointing the LRO imager toward the Chang’e-4 touchdown site within the Von Karman Crater on January 31 and hopefully record valuable data on the landing plume. As part of the collaboration agreement, NASA and CNSA will publicly share “any significant findings resulting from this coordination activity” at the 56th session of the Scientific and Technology Subcommittee meeting of the UN Committee on the Peaceful Uses of Outer Space, due to be held in Vienna, Austria, in mid-February. The part you highlighted from the Inquisitr article only pertains to the observation of the Chang'e-4 lander, not to any future NASA mission. In addition, the author misinterpreted the Twitter post they linked, thinking Congressional approval was still needed when it has already been granted (for this specific experiment, which has already been attempted, unsuccessfully). As for the SMH article, its claim "China has agreed to a NASA request to use its Chang'e-4 lunar probe for future American exploration of the far side of the moon," supposedly based on a CCTV report, is likely unfounded (unsurprising given the typical poor reporting from Australian media concerning China) since the SCMP article on the same CCTV report mentions no such agreement. Wu said China decided to work with the Americans because it was a “golden opportunity”. Notice that Wu stated his approval only in reference to the NASA experiment regarding the Chang'e lander's impact on the surface (i.e. to learn more about meteorite impacts). Regardless, CNSA along with NASA is open for cooperation and US government is what's preventing any progress, Honestly, I hope they deny approval. Blue is reserved for moderators. In future use any color but blue. N00813, Equation, Nutrient and 2 others like this.